Metropolitan Police Department and University Police Department officers investigated an incident on 21st Street between H and G streets Monday afternoon. 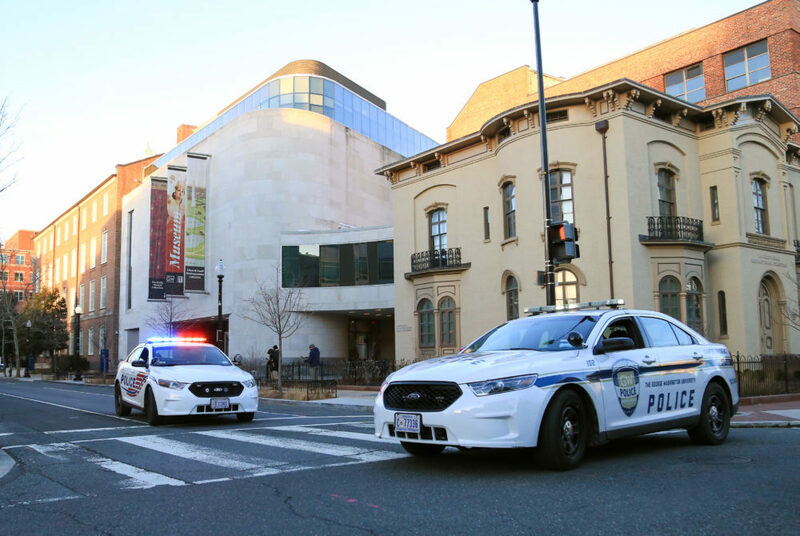 Updated: Feb. 5, 2018 at 6:40 p.m.
Police investigated a suspicious package in the Textile Museum on 21st Street Monday. Metropolitan Police Department officers responded to a report of a suspicious package at about 4:17 p.m., according to police officials. MPD spokeswoman Rachel Reid said suspicious bags were reported in the museum. Police blocked off a stretch of 21st Street while the investigation continued. GW sent an alert at about 5 p.m. saying police are “investigating an incident” on 21st Street between H and G streets and asking community members to avoid the area. Both MPD and University Police Department officers are on the scene, according to the alert. A University spokeswoman said the Textile Museum and Corcoran Hall were evacuated while MPD conducted an investigation. She referred questions to MPD. GW sent out another alert that the streets were reopened and police activity had been cleared at about 6:17 p.m.